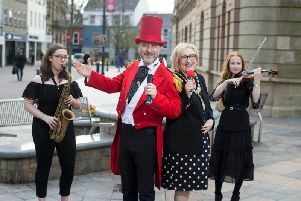 Daniel O’Donnell is set to play a major charity concert in Banbridge thanks to a special connection to Banbridge Rotary Club. The club is hosting an evening with Daniel O’Donnell in the Seapatrick Parish Centre Scarva Road, Banbridge on Monday 6th February 2017 at 7.30pm. Daniel’s step-daughter is married to Rotary Club President Lynda Shields’ son, and he has told Lynda how much he is looking forward to the evening. “Whilst it’s a great thrill to be able to play in large venues across the world in front of thousands of people, what I really enjoy is playing in smaller, more intimate venues such as the Seapatrick Parish Centre. I intend to make the evening very informal,” he said. “My full band will not be with me and so this will give me the opportunity to meet many of my fans. “They all mean so much to me and to be able to talk to them and sing many of their favourite songs will be a real thrill. I am also hopeful that Majella will be able to come with me. “I am very grateful to Banbridge Rotary Club for agreeing to donate some of the proceeds to Donegal Mind Wellness – a charity which she founded in 2014. All of the proceeds will go to three charities – Tiny Life, Southern Area Hospice and Donegal Mind Wellness. Tickets, priced £35, will be on sale in the Downshire Arms Hotel, Banbridge on Saturday 10th December from 10.00 am until 5.00 pm. The Rotary Club is also supporting two other well-known charities. Tiny Life is Northern Ireland’s premature and vulnerable baby charity, dedicated to reducing premature births, illness, disability and death in babies. The Southern Area Hospice is also a very worthy cause, providing specialist palliative care for people across the Southern Trust region. Rotary Club President Lynda commented, “Daniel has thousands of fans far and wide and this will be a most enjoyable evening.